When Craig Nichols launched the North American Organic Brewers Festival in 2003, the beer calendar was pretty barren. There weren't daily beer events in those days and there were only a few large events. 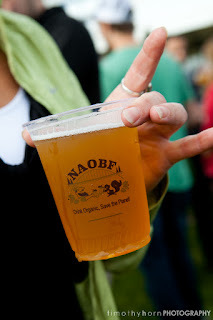 Things have changed dramatically as the NAOBF returns for 2015. Festival dates are August 13-16. The first thing you ought to note is the move from June, when the event was held for quite a few years, to August. Nichols suffered through some truly lousy weather in recent years, prompting the move from unpredictable June into typically dry August. We'll see how the move works out. Bizarre weather struck the Oregon Brewers Festival last year and again this year. Meanwhile, the Fruit Beer Festival, held in June, enjoyed perfect weather both years. The weather is fickle. It isn't mentioned in the press materials, but organizers considered moving the event from centrally located Overlook Park to a location outside the city core. Why would they do that? Because Overlook, though it is easily accessible by MAX, bus or bike, has almost no parking for folks who have to come by car. I suspect they stayed at Overlook because a move outside the city core would have cheapened the event's mission of promoting sustainable values. A move may still happen down the road, depending on how they perceive the parking problem. There may be venues out there that would work better than Overlook. This year's event will feature 63 organic beers, ciders, meads and braggots from 36 breweries located in the US, Canada, Germany and England. Styles are all over the place, with a smattering of everything. I have not yet built a target list, though I will be posting some favorites after I attend next Thursday. You can find the complete list of beers here. An addition this year is the Merchant du Vin Organic Bottle Garden, which will feature bottled beers and ciders. Pinkus Müller, the world’s first certified organic brewery, will be tapping kegs of Ur-Pils and Münster Alt in the Merchant du Vin Garden at 4 p.m. Thursday, Friday and Saturday. Only tasters will be available and they'll cost two tokens. Hey, this stuff is rare. For those not in the know, admission to the NAOBF is free. You'll have to buy a compostable cornstarch cup for $7 to taste beer. And you'll need some tokens at $1 apiece. One token will get you a taste of most beers; full glasses of most beers will set you back four tokens. This is pretty much the pricing structure you see at most area festivals. Nothing bizarre here. One the reasons to support this event is garbage. Yep. Large events like this one generate a shitload of garbage. The NAOBF generated more than 2,000 lbs of trash in 2014. But they kept 95 percent of that out of landfills via aggressive composting and recycling efforts. They expect about 12,000 attendees this year and will probably wind up with about 100 pounds of actual garbage. Organizers would like that number to be zero. Maybe someday. Check out the event website for more information. Looking forward to a fun event. the NAOBF moved because the PIB took their dates in June, not because of bad weather. I'm aware of the issue with PIB dates. I reported it the way I did because of conversations I had with an NAOBF organizer who expressed an interest in moving the event out of June due to weather issues.That made sense to me. Now they say there was never any consideration of changing dates and that they were forced to do that by PIB. Fine. But I don't think there was much love loss between this event and the month of June.